The Lab gear LDL102R is a compact aerial amplifier with a single input and 2 outputs. The LDL102R is compatible with the 4G phone system, and will not suffer from any 4G interference issues. 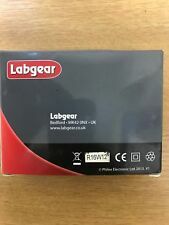 The Lab gear LDL102R is ideal for Sky TV distribution because it can be powered from the RF output on the Sky box. 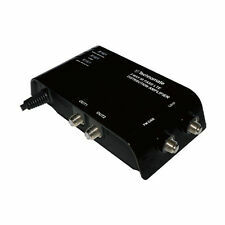 TV Signal Booster High Gain Amplifier 2 Outputs Silver Maxview Brand. ANTSIG ANTENNA DISTRIBUTION AMPLIFIER 4G FILTER. Designed to amplify TV & DAB/FM signals in poor reception area. Boosts signals even in poor reception areas. 1x Booster. Philex TriStar 2 Way Plug Through TV Signal Amplifier. TV SIGNAL BOOSTER WITH VARIABLE GAIN. Boost your Signal strength in poor reception areas. Coaxial Input & 2 x Coaxial Outputs. Designed for use with Digital Terrestrial, DAB & VHF signals. Freestanding or Wall Mounted. 2 way signal booster. Note: The Variable Signal Booster unit is not weatherproof or for permanent outdoor use, so must be mounted inside the vehicle. 0-18dB Variable gain boosts and distributes the signal strength of all incoming UHF/VHF signals to enhance picture and sound quality. SLx Gold 2 Way Aerial Amplifier and Signal Booster for Digital Freeview TV, DAB. MAXVIEW PLUG IN TV/FM AMPLIFIER AERIAL/VIDEO in 2TVout. Plug in signal amplifier for tv/fm or video output. Satisfactory gain of 9.5dB per outlet. Needs to plug into wall outlet or extension lead as pins will not fit into low level socket in skirting. The Vision Plus VP2 Digital Amplifier is fully wideband for television transmissions and is designed to be used with Vision Plus STATUS antennas with orange logos that do not have pullout telescopics. The VP2 can also be used with the following range of antennas that only provide a TV output: IMAGE 410, IMAGE 420 IMAGE 440, IMAGE 610 and IMAGE 620. TriStar 2 Way Plug Through TV Signal Amplifier BNIB. Dispatched with Royal Mail 2nd Class. Vision V65-202 TV Booster and Distribution Amplifier with IR Return. Short circuit protection and maximum output limiter prevents overload. LED power on indicator. Fully shielded to minimise signal noise. Power: 9Vdc TV set top box. Max output level: 94dBuV. Output: 2 x F connectors. 2 WAY UHF COAX PLUG BOOSTER. FLAT GAIN RESPONSE ACROSS FULL FREQUENCY SPECTRUM ENSURES OPTIMUM DIGITAL RECEPTION. BOOSTS SIGNALS EVEN IN POOR RECEPTION AREAS. If either of these are missing or if the seals have been tampered with the warranty is void. we then check the item to see if it works and that all the components are in working order. Kind Regards. A 2 WAY RF SIGNAL SPLITTER FOR TV/RADIO SIGNALS IN WATER PROOF ENCLOSURE FOR EXTERNAL OR INTERNAL USE. SADDLE AND CLAMP CONNECTIONS. Gain per split: 12dB. Two Way Aerial Amplifier. With built-in IR pass for use with 'magic eyes'. Built-in IR pass for use with 'magic eyes' (not included). UK mains plug fitted with 3A fuse and 1m power lead. Philex 27822HSR 2 Way TV Signal Booster - 4G and RED Compliant. 1x Booster. Antsig Two Way TV Amplifier. Condition is New. Dispatched with Royal Mail 2nd Class. A built-in LTE filter is included to eliminate 4G LTE interference. LTE Protected. As well as splitting an input signal to two outputs, it can be used as a signal booster. It is also compatible with TV-Links (Magic Eyes). 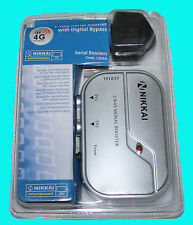 NIKKAI 2-Way L22AG AERIAL BOOSTER WITH DIGITAL BYPASS - LTE 4G FILTER. Nikkai Aerial Amplifier with Digital Bypass 2 Way. • Split and distribute the signal from an aerial, Sky box or Freeview box• Built-in digital bypass for use with Sky remote extenders (such as our PT73Q Sky Link)• Up to 12dB gain to each output• Short circuit protection on each output• Less than 5W power consumption. FREQUENCY VHF UHF 470-863 MHz. 10-25 dB Variable Gain. 1 Input 2 Output. During that process you will be issued with an RMA number. 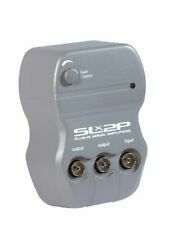 Single FM/VHF/UHF F-type input, 2 FM/VHF/UHF F-type outlets. The Vision Plus VP2 Digital Amplifier is fully wideband for television transmissions and is designed to be used with Vision Plus STATUS antennas with orange logos that do not have pullout telescopics. The VP2 can also be used with the following range of antennas that only provide a TV output: IMAGE 410, IMAGE 420 IMAGE 440, IMAGE 610 and IMAGE 620. This powerful amplifier with high gain and low noise capabilities will ensure improved performance, especially in those areas that suffer with poor reception..
2 WAY F-TYPE ANTIFERENCE DISTRIBUTION AMP FOR FREEVIEW FM/DAB LTE. ANTIFERENCE 2 WAY F-TYPE DISTRIBUTION AMP FOR FREEVIEW / FM DAB. ANTIFERENCE 2 WAY IR REMOTE LINK F-TYPE DISTRIBUTION AMP FOR FREEVIEW / FM DAB AND FOR ALLOWING MAGIC EYES TO WORK ON A SKY LINK SYSTEM. Nikkai Aerial Amplifier with Digital Bypass 2 Way. • Split and distribute the signal from an aerial, Sky box or Freeview box• Built-in digital bypass for use with Sky remote extenders (such as our PT73Q Sky Link)• Up to 12dB gain to each output• Short circuit protection on each output• Less than 5W power consumption. Good working condition An off/on switch has been added on to it so as it dosent stay on all the time. The booster will work with Digital Terrestrial, DAB and VHF signals. Features coax aerial input, coaxial outputs, key-slot mounting holes, power on LED and mains lead. Connector Coaxial Coaxial. Can also be used with a hifi to increase DAB/Digital Radio Reception. Signal Booster, SLx TV Twin Output 27822HSR - Distribute Your HD TV/FM/DAB Signa. Free standing or wall mountable unit. Philex 27822HSR 2 Way TV Signal Booster - 4G and RED Compliant. RED Compliant - Updated to improve signal handling. The SLX High gain UHF masthead amplifier has been designed to improve TV reception quality in weak signal areas. Durable and weather resistant, the amplifier can be either mast of wall mounted. To get the best results the amplifier should be mounted 1m below the aerial. 1x 32 Aerial. Receives all locally available digital TV signals. 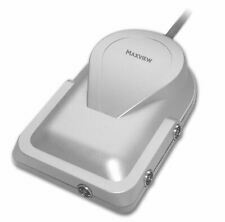 Maxview 12/24v Variable Signal Booster MXL008. Increases the strength of all incoming terrestrial TV (digital/HD/3D) and radio (DAB/FM) signals in weaker reception areas. O Contents: 1 TERRA AMPLIFIER. o Type of connection: F type. Photos are for illustrative purpose only. o Model Number: MAT14MM-HA205R30. o Number of inputs: 2. o Number of outputs: 2. oGain UHF: 18 dB. MAXVIEW Caravan camping & Boating 2 Output Variable Signal Booster 12/24 V. Condition is Used. Dispatched with Royal Mail 2nd Class. House connection amplifier HA 40119 N A/P. Manufacturer: Polytron. Marke POLYTRON. Equalizer: 2 slots. With the jumpers is a precise setting of the output level possible. The housing concept corresponds to the protection class IP 65. Distribution amp.Bought but never used as not suitable. Not boxed. THE SLX GOLD 28102R 2 WAY IS AN AERIAL AMPLIFIER AND SIGNAL BOOSTER THAT IS DESIGNED TO INCREASE AND IMPROVE TV, DAB AND FM SIGNALS. UNLIKE THE MORE BASIC SLXB MODELS IN THE SLX RANGE THE SLX GOLD HAS AN INTEGRATED DIGITAL BYPASS SO IT CAN BE USED WITH A SKY LINK (MAGIC EYE). O Gain VHF: 3 dB. o Gain UHF: 15 dB. 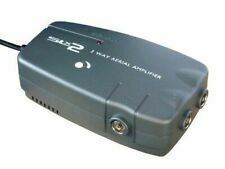 o 2 way VHF/UHF tv amplifier and filter, ideal for TV and FM signals to be split to 2 TV's, with 2 way UHF/VHF amplifier with integrated power 1 input 2 outputs. o Contents: 1 AMPLIFIER & FILTER. O Contents: 1 AMPLIFIER SPLITTER. o Die cast housing inside plastic heavy duty casing. Note: Photo for illustrative purposes only. o Width: 133 mm. o Number of outputs: 2. O Contents: 1 Masthead Amplifier. o Type of amplifier: Masthead amplifier. o Gain UHF: 24 dB. o Power adaptor: Included. Note: Photo for illustrative purposes only. IR powering and short-circuit protection on each individual output. During that process you will be issued with an RMA number. High gain/high output, ideal for digital TV. High quality and fully screened with F-connectors.